The annual Mobridge Regional Hospital and Clinics Fall Bazaar will be held on Saturday, Nov. 4 from 9 a.m. until 2 p.m. at Scherr-Howe Event Center. There will be kids’ games, raffles, a bake sale and drawings for prizes. Lunch will served. Charlotte Pepin, (right) daughter of Nate and Jen Pepin of Mobridge, picks out a treat from Tim O’Conner (left) as mother Jen looks on. 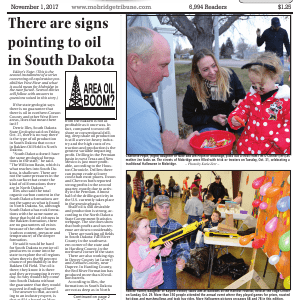 The streets of Mobridge were filled with trick or treaters on Tuesday, Oct. 31, celebrating a traditional Halloween in Mobridge. 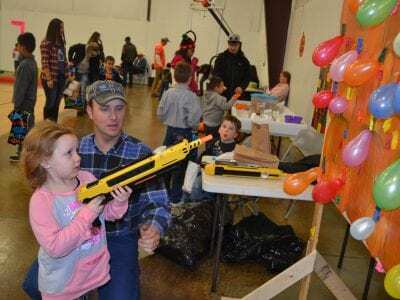 Paislee Fuhrer, daughter of Kaylee Trottier, takes aim at balloons at the Harvest Festival, held at the Edge Center on Sunday, Oct. 29. More than 350 people attended the annual event where they played games for prizes, roasted hot dogs and marshmallows and took hay rides. More Halloween pictures on pages 6B and 7B in this edition.